taking up a minimal amount of space. Easily folds for storage when not in use. 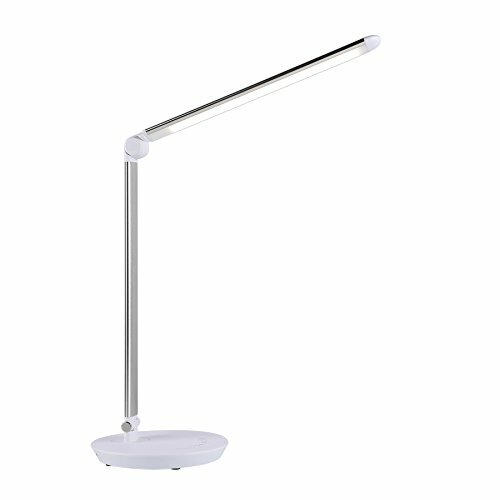 Base Size: 7.1" x 0.8"
Arm Length: 16.5" ~ 30.7"
⚽⚽EVEN LIGHT DISTRIBUTION: 108 even-distributed LED chips together with a large shade cast lights evenly, offering complete illumination coverage over your PC or laptop; 7 bright brightness levels help you to enhance working productivity and study efficiency. ⚽⚽WIDE APPLICATION, 3000k-6000k adjustable color temperature plus 7 brightness levels create countless ambiance and light intensities to accommodate various illumination needs in different environments; let CO-Z led desk light decorate your life with amazing colors. ⚽⚽INTEGRATED USB CHARGING PORT: Integrated 5V/1A USB charging port allows this lamp to work as an adapter to charge your iphone, cellphone, hand light, power bank or whatsoever, always keeping your electric equipment full of power. ⚽⚽LARGER ILLUMINATION AREAS, rotatable table top led reading lamp head creates countless lighting angles as well as larger illumination areas, lighting up wherever you want. ⚽⚽WARRANTY, for your worry-free shopping experiences and satisfaction, we promise a 1-year warranty and 100% free exchange; please feel free to contact us if the product is defective or arrives damaged.